This is the time of year that the seed catalogs come out on our little Texas homestead. We circle various vegetables, order new perennial fruit and nut trees and begin preparing the soil for the upcoming gardening season. Fava beans and garlic and a few hardy herbs are fresh and green, but that’s about all for now. My hands look a little different, having traded in the ubiquitous under-the-fingernail dirt for bits of dough, from rye sourdough baking and black smudges from stoking and cooking on our wood stove. I’ve been fond of rye for a long time and given its rich history as a traditional grain for many societies, it seemed like a good fit for our kitchen.For those of us interested in traditional foods, how could we skim past that rye sourdough bread slathered in rich, yellow butter and eaten with raw milk as cited by Weston A. Price himself? Rye is, indeed, a traditional grain. So I set out to make a host of loaves and treats from that grain – all fermented for at least 12-24 hours and full of traditional fats and sweeteners. The results have been exciting, especially since all of us (even those who do not eat wheat) can gather around these baked goods. But rye can be tricky to work with when wheat is not in the mix. It took me a couple of years to nail down the idiosyncrasies of this beautiful gray-colored, richly-flavored grain. It all started with a 50 pound sack of rye flour I procured when I found that organic rye cost half the price of spelt and other ancient wheat varieties I prefer to bake with. Fermenting the loaves for 12-24 hours – sometimes even longer – produced a robust flavor and easy digestibility. After numerous loaves – and experiments with various hydration levels – I found several doughs that worked incredibly well with a moist interior, rich flavor, and no wheat flour in sight. I quickly found out that rye isn’t just for those stodgy loaves studded with caraway. It plays very well with traditional fats and works a treat with my bubbling, tangy sourdough starter. So I began putting together a repertoire of low or no-knead loaves, simple breakfast, and snack breads, and even sweet treats made from raw honey and traditional fats. The result is this labor of love, 100% RYE. This book holds a collection of our family’s well-loved recipes for everyday breads like Fluffy Rye Sourdough Pancakes, Rye Sourdough Tortillas, and the Sourdough Rye Boule below. It shares the end to my quest for the perfect honey-sweetened brownie in Rye Sourdough Brownies and our favorite Rye Sourdough Pie Crust. This has truly transformed our kitchen as even my son and husband – sensitive to modern, processed wheat and many non-fermented grains – can share a loaf or a celebratory dessert with the rest of the family. Because not everyone can or wants to bake with a sourdough starter, I also share instructions for alternatives such as soaking or “quick” baking with conventional leavening agents like yeast and baking powder. Made with 100% rye flour, sourdough, and a touch of honey, I hope you enjoy this wheat-free loaf as much as we do. Mix all ingredients together well with a wooden spoon until a sticky but cohesive dough is formed. Generously butter and flour the bottom of a baking sheet, or line it with parchment paper. The dough should now be kneaded for five minutes. This dough is very sticky and you do not want to add more flour to it in the process. The best way to do this is to wet your hands, scrape the dough into one hand and hold it while adding a bit of water to the mixing bowl. Now knead the dough in your hands, stretching and folding it, while using the water in the bowl to moisten your hands every time the dough begins to stick too much. Do this for five minutes. Once kneaded, form the dough into a tall round, smoothing out the top and stretching the sticky dough underneath. The dough will spread considerably while rising so be sure to form it as high as is reasonable. Place the round on prepared baking sheet, gently oil the top to prevent drying and cover with plastic wrap or a damp towel. Allow to rise at room temperature for 6-12 hours, or until it has spread and puffed up a bit. This is dependent on the warmth of your space. For a longer fermentation/rise time, keep it cooler. For a shorter fermentation/rise time keep it warmer. Preheat the oven to 450 degrees. Remove the towel or plastic wrap and ready a bit of extra flour and a very sharp knife. Flour the knife and cut slashes in the top forming an almost tic-tac-toe shape on the loaf. Sprinkle the top with flour and place in preheated oven. Immediately turn the oven down to 350 degrees and allow to bake for approximately 35 minutes or until an internal thermometer reads 200 degrees. Allow to cool 10 minutes before serving. Best eaten within 48 hours of baking, slathered in grass-fed butter. Wow, this is awesome! Thanks for sharing this on your blog, I love finding new whole foods bloggers out there! I also love rye, but have never used 100% rye. Now I want to try it! I might have to get the book. I haven’t heard about 100% Rye before reading this blog, but I absolutely love the flavor of rye. And I think this bread would make the most delicious sandwich. I’ve had so many failed attempts at baking with rye flour. I have a bag of rye berries I experiment with periodically. So please help me with following this recipe: How do you create the sourdough starter or use yeast instead? Thank you. Jenny has a great tutorial for making your own sourdough starter here: https://nourishedkitchen.com/how-to-make-a-sourdough-starter/. 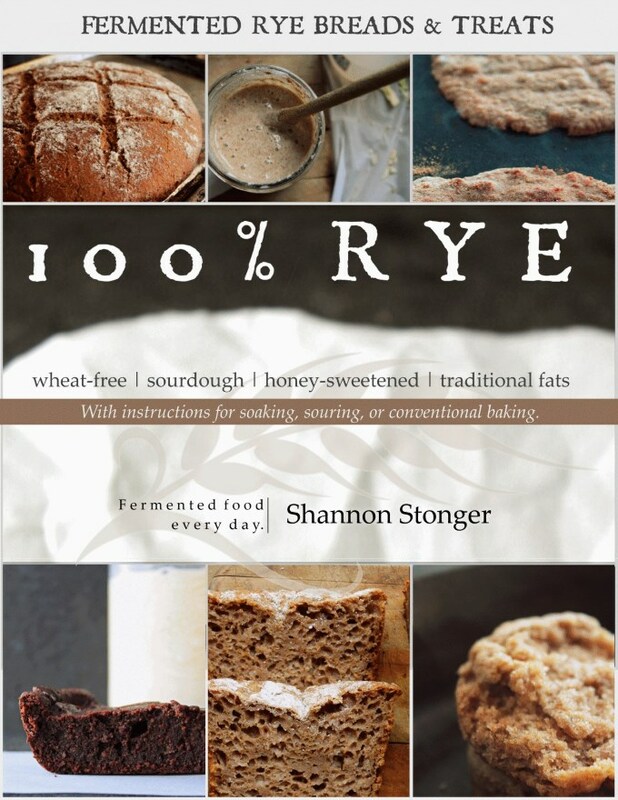 For the rye recipes – and I say this in the book – I generally use a 100% hydration starter. That is, I keep my starter fed a 1:1 flour to water ratio. Yeast can be used and I have a recipe in the book for a soaked, yeast-risen alternative that utilizes 2 teaspoons of yeast after a soaking period with cultured dairy. I am a little confused. I got your book – it is beautiful! – but your recipe for your start is 166% hydration since you are do a 1:1 ration (flour to water) using volume (cups) and not weight. Should I be doing it by weight instead? I have tried a few recipes so far and my loafs have come out pretty dense (not airy) and chewy. Still delicious, but definitely not like the pictures. Am I doing something wrong?? Happy to stumble upon this article and recipe, but kinda bummed the cookbook isn’t available in full color paper version! I’d have bought it straight away! Can I use my traditional wheat sourdough starter in this recipe? I’d love to try to incorporate some rye, but don’t want to keep a separate starter for it. Thank you!!! 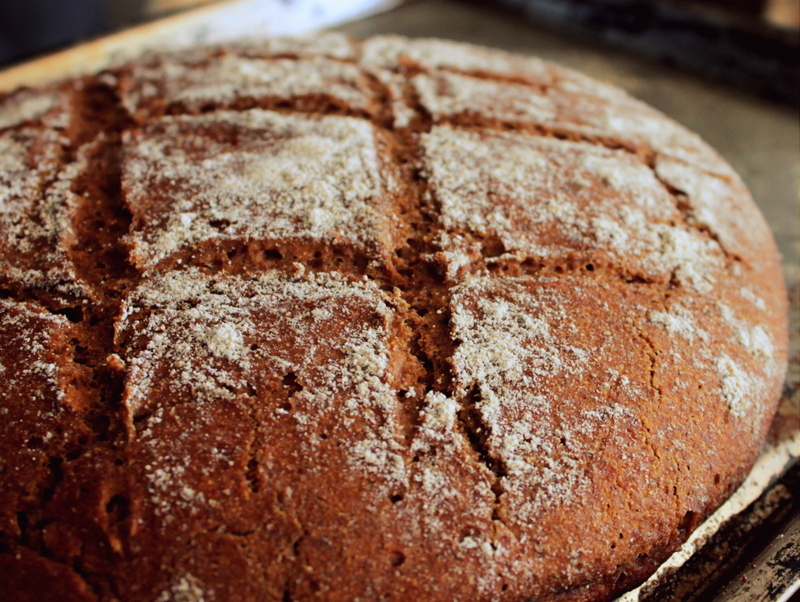 I’ve been looking for a sourdough rye recipe for awhile now-this one is perfect. It’s my favourite type of bread mmm with lots of butter and soft runny egg yolks. I just moved and no longer can I get the local russian sourdough rye, time to start making my own! This looks great! Do you have a source of rye that you can recommend? I’ve been looking for something stone ground (or that I can grind) similar to the traditional grain used by cultures like the Swiss. Thanks! I’m wondering if this recipe is suitable for freshly ground rye flour–I have heard from some sources that sourdough doesn’t do well with freshly ground flour. 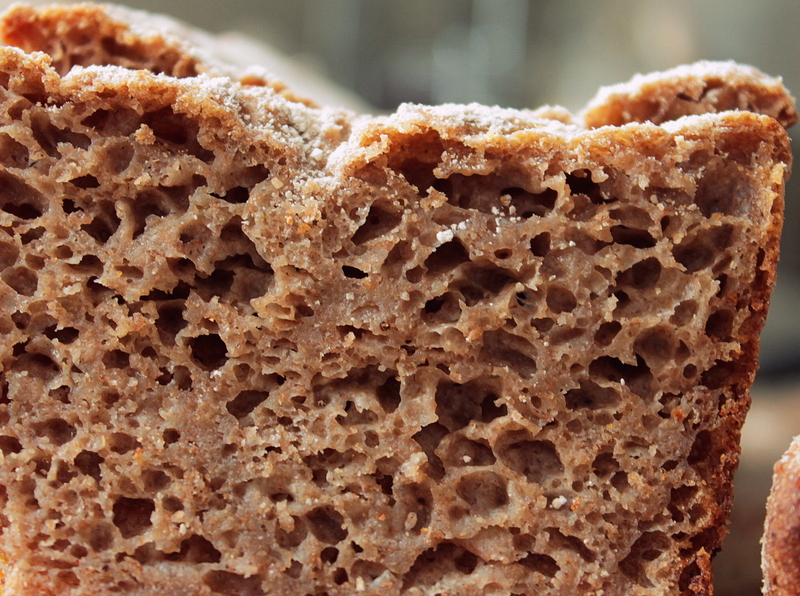 Karen – I have yet to have any trouble with freshly ground rye flour, especially if your starter is maintained with it. I always find that when a starter is maintained with one grain or flour type and the bread uses something different, that is when more unpredictability occurs. I’m dying to try this recipe! How do you go about getting a active sourdough starter. I really want to try making the boule. Bought the online book and tried to make the no-knead sourdough loaf. Followed the instructions and the next morning no rise. Starter when fed will rapidly more than double! Dough is so dense I cannot stir it, It is very dry. I am at 4600 ft. altitude, does that have anything to do with the density? Thanks! I’d love to know how I could incorporate some kamut flour into this! I love the idea of a combination. Should I feed my sourdough starter with some kamut along with the rye if I am planning to make the bread this way? Does your book have options on how to add other flours in smaller amounts along with the rye for a more mild tasting bread once in awhile? (I’d like to make it both ways, depending on the occasion) I’ve also heard that with rye, you mix the ingredients, then leave it alone, but you have us mixing it for 5 minutes. Have you tried it with no mixing beyond what it takes to combine? Thanks! Hi! I made my own sourdough starter from sprouted whole rye flour and used the same flour to make the bread dough. I used ghee instead of melted butter. I cooked the loaf for 35 minutes and it was still doughey… it looked like bread but any pressure just mushed it together. I cooked it for another 10 minutes and it is still exactly the same. It’s in the oven for another 10 minutes now but I don’t know… maybe I did something wrong? I’ve made this recipe several times now and am in love with it! I had to adjust the quantity of water a bit and it takes far longer than 35 min to bake in my oven, but I find as long as I get the internal temp to 200F it is perfect! Thanks for the wonderful recipe! Hi, thanks for the recipe. Is the flour in the recipe specifically for rye flour? When you say a 1:1 hydration ratio…what exactly does that mean?? Thanks! I’m having the same problem as Allie. Twice now the bread has been gummy on the inside. I’m not sure what I’m doing wrong. Make sure the internal temp is 200F. Mine tales around an hour to bake, the last few times I’ve gone with the internal temperature instead of the time and it’s turned out great. thank you for the recepe ! I have tried baking it in dutch oven today – its even better! If I want a little but milder bread, I substitute 1c of rye with 1c of white. I come from Eastern Europe and it is very important for us to have rye bread, missed it so much until i got into making this! Sounds great. I guess you could make some rolls out of this dough. I think I will try to. My flirts attempt – dough was pretty sticky but followed the instructions anyway. The dough was left to rise overnight but spread out to less than an inch high. Looks more like pizza dough now. Did I need to add flour? Do you have good directions for sourdough starter. Is it in the Rye cookbook? This bread sounds delicious Shannon. I have made sourdough bread in the past using wheat flour. It always made a nice light tangy loaf of bread. I was just wondering if using all rye in your recipe makes a dense loaf of bread as I don’t particularly like dense bread but really enjoy the taste of rye bread. Hello what would be the quantity of starter to use in grams?! You could try and let us know how it goes; that said, its elimination will not further your goal of balancing omega 3/6s. This looks great! Do the loaves freeze well? I’m not sure, but you could try. Do you have a similar recipe that will keep longer? I am gluten intolerant and eat only 109 percent rye * very difficult to find even in specialty stores. I am single and on a special diet and can only eat a slice a day. I have no freezer. If you are gluten-intolerant, you should not eat rye at all. Hi, I’m making a 66% rye sourdough in my little artisan bakery, and having trouble with it being too stodgy, not rising, and usually having a dense layer on the bottom. It is a 66% hydration, no molasses, and is so slack I have to bake in tins. Bake time is at least 35 to 40 mins. I prove it for about 4 hours at room temp, then refrigerate overnight, and take it out next morning (12 hours later). It then has one hour to warm up before baking. Is there anything obviously wrong in this process? This might be me being dumb but can it be frozen once baked ? Thank you for posting this. I have your book on my wish list! Can I use a Dutch oven with this recipe also?